In war, the difference between living and dying can come down to a single step. Ret. Air Force Staff Sgt. Len Anderson knows this too well. On patrol in Afghanistan in 2012, he was stopped just before he stepped on an improvised explosive device. Who saved his life? It was Azza, his military working dog, who alerted him to the danger. Later in the patrol, Azza sensed another IED and signaled to Anderson to stay in place. But this IED was remotely activated. It detonated. Anderson suffered massive injury, but thanks to Azza he escaped with his life. Tuesday is K9 Veterans Day, when we honor canine heroes like Azza and the thousands of other dogs who have served alongside our troops. Ordinary Americans can help give these dogs the recognition they deserve by observing this day. Extraordinary Americans can support efforts to reunite them with their handlers after their tours of duty are over. Working dogs in the American military date back to the country’s founding when Benjamin Franklin recommended their use.They will “confound the enemy,” he wrote, “and be very serviceable.” Since then they have served in nearly every American war. During the Civil War they were used as messengers and guards. In World War I, Sergeant Stubby, one of history’s most famous war dogs, saved American fighters from mustard gas. War dogs sniffed out Japanese positions in the Pacific Theater in World War II. Nearly 4,000 dogs served in Vietnam, saving 10,000 American lives. These dogs have taken on even more importance in the 21st Century wars in Afghanistan and Iraq because of their ability to detect the enemy’s weapon of choice: the IED. These hidden bombs are the “number one threat,” said Ret. Adm. Mike Mullen, former chairman of the Joint Chiefs of Staff. They have been responsible for roughly two-thirds of U.S. military casualties in Iraq and Afghanistan. Even when armor can block IED shrapnel, the blast wave can create traumatic brain injury and post traumatic stress. The Defense Department has spent billions of dollars on new technology to better identify and disarm IEDs. But nothing they’ve come up with can equal the prowess of dogs, whose sense of smell can detect explosive odor concentrations as small as one or two parts per billion. With their 220 million olfactory receptors (versus humans’ 5 million), dogs can even sometimes detect explosive concentrations that cannot be measured with standard equipment. The military alone only locates about half of the IEDs planted in Afghanistan and Iraq. But with dogs, the detection rate increases to 80%. “They are an invaluable asset for freedom of movement of our ground patrols,” says the Defense Department. In 2014, the Taliban even took a military working dog hostage. The U.S. military currently has more than 1,600 dogs deployed on active duty around the world. More than 50 have been killed in action since 2005. But they’ve saved thousands of American lives and limbs in the process. These dogs are on the front lines of our wars and should be recognized for this heroism on March 13 and throughout the year. The bond between military dogs and their handlers is one that only war can forge. They depend on each other for survival, with the trailing platoon’s safety in their hands and noses. Until recently, military dogs were generally left behind after completing their tours. 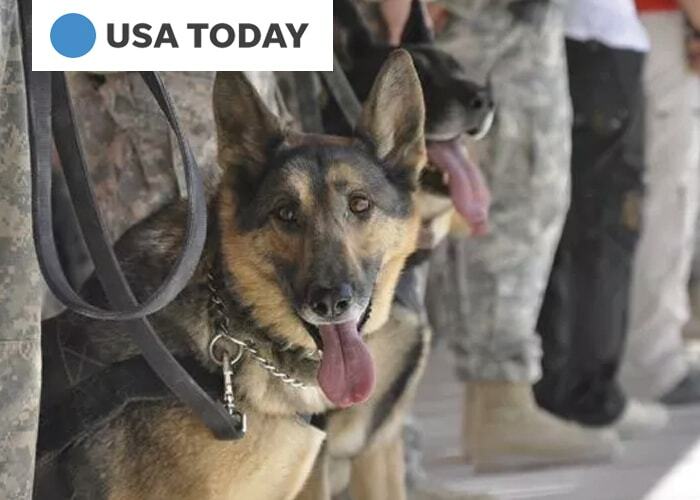 Even after Congres srequired in the 2016 National Defense Authorization Act that retired military working dogs be returned to U.S. soil and offered to their former handlers first, they can remain stuck on U.S. bases abroad. Nonprofits like American Humane are working to bring these stranded heroes home, so they can enjoy retirement together. That’s been the case for Andersen and Azza, who were reunited following Andersen’s many surgeries. Azza can now provide a different type of support than what she offered on the battlefield — with more carefree walks together ahead.